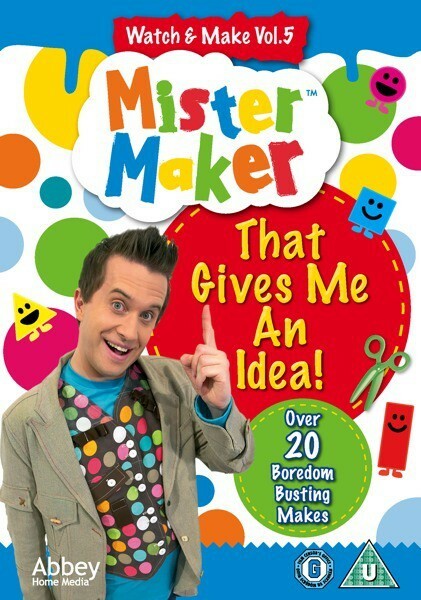 Abbey Home Media have very generously offered me 3 copies of the new Mister Maker: Watch & Make Vol. 5 DVD to giveaway! Mister Maker: Watch & Make Vol. 5 * is released on 3rd June 2013. Mister Maker transforms everyday objects into pieces of art in his magical studio, and is one of Georgie’s favourite cbeebies shows – she always dances along to the “I am a shape” song! Mister Maker Makes a Splattered Space Picture – A splattered space picture, noisy coin clackers & hilarious worms in a can! Mister Maker shows you the perfect boredom buster! – Splattered stencils, an incredible ice cream cone game and wobbly eggs! Mister Maker has fun with bubbles! – Bubbles, a fabulous fish with shiny paper & space skittles that are out of this world! Mister Maker makes a brilliant Wrap Paper! – Brilliant bubble wrap picture, a straw powered rocket & crazy carnival shakers! Mister Maker creates a Space Age City! – Transform everyday objects into incredible insects, torn paper & a space age city! To enter this giveaway, leave me a comment letting me know which of these “makes” you want to watch the most, and then fill out the rafflecopter widget below! Mister Maker creates a Space Age City! – Transform everyday objects into incredible insects, torn paper & a space age city! – Would love to be able to make these !! I’ve got loads of bubble wrap so the make using that! ◦Mister Maker Makes a Splattered Space Picture – A splattered space picture, noisy coin clackers & hilarious worms in a can!